Today, the Kaskel’s resort lives on. And its new owner is none other than President Trump, who picked up the property at auction in 2011 for $170 million and renamed it the Trump National Doral Golf Club. Between the time the Kaskels owned the massive site and Trump took over, Doral has become one of Miami-Dade’s most significant industrial office markets. More than 28 national and global corporations, including the Miami Herald, Univision and Carnival Cruise Line, to name a few, are headquartered in Doral. According to a 2017 Florida International University study, Doral is home to 775 firms that do manufacturing, pharmaceuticals, energy development and global logistics and trade; employing 11 percent of the city’s population and generating more than $2 billion in annual sales. Doral’s economic drivers have fueled mostly office and industrial projects with some gated community residential developments. 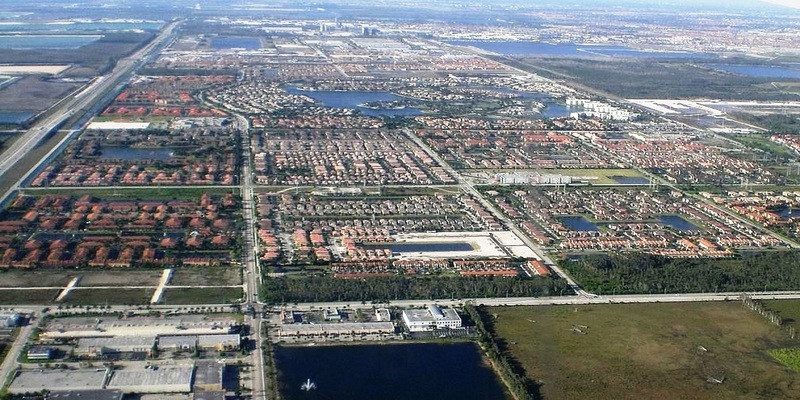 Among the first housing projects was Doral Park, a joint venture between Lennar Homes and the Kaskel’s grandson Bill. In 2013, Codina Partners broke ground on Downtown Doral, an ambitious mixed-use project that the developer claims will create a true urban center for the young city. The master-planned community opened about three years later and ushered in a new wave of retail and food and beverage options typically seen in neighborhoods east of I-95, such as Aventura or Brickell. Among the trendy tenants are women’s fashion retailer Cattiva Boutique and the Japanese-themed Dragonfly Izakaya and Fish Market. The retail district is meant to serve residents who will be occupying 2,840 residential units — including condos, townhouses and rental apartments — Codina has planned for Downtown Doral. The first tower, 5252 Paseo, was completed in early 2016 and sold out, as did the second tower, 5300 Paseo. Carr said Downtown Doral represented a huge risk for Codina because of the city’s long history as an industrial and office market powerhouse, but had no real track record with ambitious mixed-use projects. “We’re seeing more local South American buyers that have been here for 10-plus years selling their previous properties to upgrade to newer construction that offers amenities for their families. Doral is very attractive to families due to the schools, gated communities and amenities the city offers,” said Elizabeth “Eli” Santurio, the Keyes Company. “The demand for office space in Doral has really pushed demand on the residential side, which has created a need for more goods and services in the area. That has led to development of a robust retail infrastructure with brand new shopping centers,” said Joe Abood, Avision Young. $1.5 million on Aug. 16 for a three-bedroom, four-bathroom house totaling 4,320 square feet at 115 Northwest 128th Avenue. $175,000 on Sept. 5 for a two-bedroom, two-bathroom condo totaling 992 square feet at 8160 Geneva Court. $6.7 million for a 10-bedroom, 10-bathroom estate totaling 11,676 square feet at 9464 Northwest 52nd Doral Lane. Median sales price per square foot: $232, 7% more than Miami-Dade average. Increase in average rent over the last year: 10% to $2,400 a month. Around the same time Downtown Doral was completed, the Related Group and Shoma Homes put the finishing touches on CityPlace Doral. The $800 million, 55-acre mixed-use project features 250,000 square feet of retail including northwest Miami-Dade’s first Fresh Market, a CineBistro-Cobb Theatre and 20 restaurants and bars. The project will have a total of 1,000 housing units broken up into 150 single-family homes, 700 rental apartments and 320 condos. Closer to the Florida Turnpike sit several new residential developments that target buyers looking to buy large single-family homes. For instance, Terra has finished most of its new community, Modern Doral, where houses are fetching between $860,000 to $1.5 million. The homes feature four-to-six bedrooms, two-to-three car garages, and 12-foot high ceilings that take up between 3,100 square feet to 4,500 square feet. The project is located next to Doral Commons, a retail center anchored by Publix and TJ Maxx developed by Terra in 2016 and recently sold to Jamestown for $71.6 million. Terra is also building Doral Square, another retail center on a 3.9-acre parking lot near the Trump National. The company plans to develop 81,000 square feet of retail and restaurants. Meanwhile, Century Homebuilders Group and Devtov are developing Mansions at Doral, a luxury single-family home community on Northwest 107th Avenue. Preconstruction prices at Mansions start at $1.2 million. And Lennar and CC Homes have plans to build 2,209 residential units, 30,000 square feet of retail space and 150,000 square feet of office space on the site of a former 130-acre golf course.